Coming Soon: Bob the Goon! Looking for something fun to do this Devil Night/ Hell Night / Gate Night (or whatever the night before Halloween is called near you)? 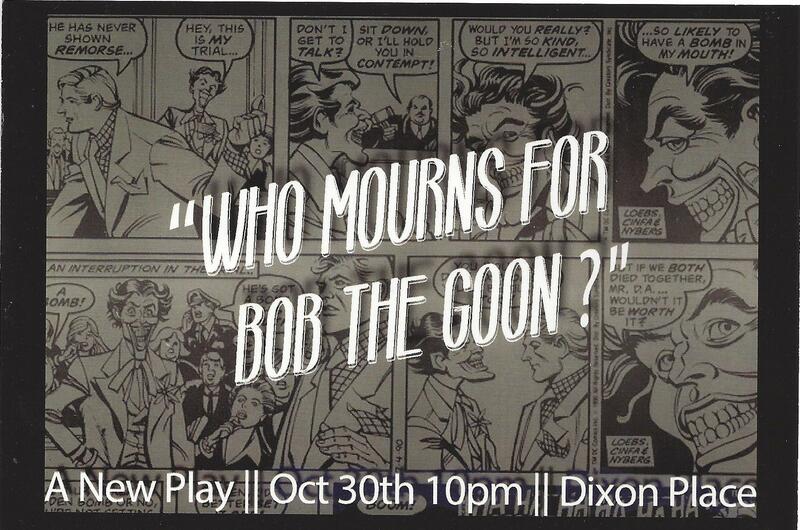 Come out to see the one-night-only showcase production of the brand-new play Who Mourns for Bob the Goon? at Dixon Place. This piece has been in development for almost a year, and after a few very successful readings (and an award at the Plant Connections Theatre Festivity) we’re very excited to finally share it in a fully-produced form. Who Mourns for Bob the Goon? is a new play about a man who believes he is the obscure comic book character ‘Bob the Goon,’ a loyal Joker henchman from the Batman comics. The audience follows Bob as he attends a special therapy group for individuals who all believe they are (or were) third tier comic book characters. Bob starts to unravel after the admittance of a new woman, Langly, into the group. The characters explore their past as the play switches from their realistic lives and settings to the fantastical comic book realms they think they inhabit. One night only! October 30th, 2015, 10:00 P.M. Featuring: Michael Fewx*, Elise Hudson*, Jon Carhart, Phillip Smith*, Dani Baum*, Matthew Rini, Jolynn Carpenter and Matt Mingle. This entry was posted in Project News and tagged comic, dixon place, halloween, joker, live, Matthew, play, rini, show, theatre on October 16, 2015 by dramamatt.